When an author has attained the status of an icon in his profession, based on the publication of works that have been declared iconic masterpieces from the earliest period of his career, it is unusual to find him engaging in experimentation in the latter stages of that career. 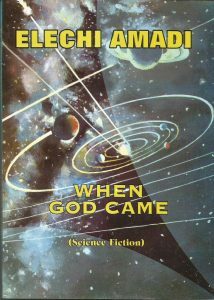 This is the surprising trajectory that this short but profoundly memorable booklet by the late Elechi Amadi represents. Although the two narrative treatises contained in this work were described by the author as an excursion into the medium of science fiction it would really be more accurate to define them as philosophical allegories. Their contents contemplate the human condition and the limits of the potential for human achievement based on the concept of the supernatural rather than simply being exercises in the conceptualization of events of an otherworldly nature, which popular science fiction often is. Instead of this Amadi’s excursion into the genre consists of two brief but highly complex discourses on the subject of humanity’s interaction with supernatural elements of ordinary existence and the consequences of this encounter on man’s understanding of his purpose for being. Viewed through the prism of his philosophical concern it is clear that in producing these two short pieces Amadi was profoundly inspired by his consideration of mankind’s future to the same extent that his celebrated early novels The Great Ponds, and The Concubine were inspired by contemplation of the past. To this extent at least Amadi’s objective in producing this unusual work is a reflection of the continuity of purpose that he maintained throughout his career. Although the collection When God Came was first published in 2011 the author indicates in his foreword that the two stories contained therein, especially the longer one entitled Song Of The Vanquished, were written quite some time before that. Nonetheless the issues raised are of contemporary significance as they deal with matters that continue to excite the imaginative concerns and apprehensions of humankind. The title story which opens the collection details what might be regarded as humanity’s first contact with an extra-terrestrial being. The light and almost ironic style in which he narrates the appearance on earth of “Mr. God” (outside the UN office in New York) seeking audience with world leaders renders the tale extremely humorous but also revelatory. Amadi displays a highly developed satirical talenmt in this tale. The fact that the visitor cannot be harmed by even the most sophisticated weaponry of mankind is a commentary on the futility of power and frailty of human assumptions of superiority. The equation of the extra-terrestrial visitor with the Supreme Creator, especially as this claim is made by the visitor himself, suggests that Amadi is proposing an interpretation of religious belief as a consequence of rational scientific thought. As the conversation between the powerful leaders of the world and “Mr. God” grows increasingly complex the “dialogue” that becomes the main purpose of the visit evolves into an investigation of humanity’s relation with its origins and its destiny. Proceeding from the premise that the visiting creator is as curious about the nature of his creation’s conduct on earth as the earth’s superior creatures are about the nature of his own existence the story barrels towards an uncertain conclusion. Neither “Mr. God” nor his interrogators are able to decide eventually on who created who. This abrupt and inconclusive denouement is remarkable for appearing to be both unavoidable and yet completely acceptable as events in the story seem to fulfill the need for communication between the spiritual and the corporeal world. Song Of The Vanquished, the second and much longer piece in the collection, is an even more ambitious inquiry into the underlying purpose of human endeavour. Taking place several millennia into the future it purports to be a report on the state of affairs in a world rendered tiny by scientific achievement. Transportation is carried out across the globe at ten times the speed of sound and human beings can live for centuries and even renew their youth through the use of incredible medical procedures. Into this supposed scientific paradise a Nigerian scientist Prof. Ekpo unleashes a paper that proceeds to undermine assumptions of universal immortality. He exposes the imminent decline and disappearance of the human species from the planet using the same arguments and formulae that he and his colleagues had used before to suggest that human invincibility was a reality. In such a circumstance his peers and erstwhile collaborators decide that he is a traitor who must be punished, but they keep running into a major problem as their own investigations into his theories suggest that he is right. Amadi turns this into a fable about humanity’s self-denial in the face of uncomfortable truths and he injects elements of customary human emotional behavior, described as having been commonplace in the twentieth and twenty-first centuries, into the process of events showing that such sentiments as love and courage are the truly immortal realities. Once again the most surprising elements of this work include the consistent use of lighthearted humour and satire as fundamental elements of his narrative technique. In the final analysis these works read like fables from the future that the author must have had immense enjoyment creating. 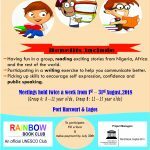 That the Rainbow Book Club has chosen to celebrate Elechi Amadi’s prodigious output and commemorate his recent passing by recommending this unusual work as book of the month for July reminds us that he was in fact trained originally as a scientist. 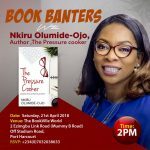 His first degree was obtained from the University College of Ibadan in Physics and Mathematics, and his first professional appointment after graduation was as a surveyor. 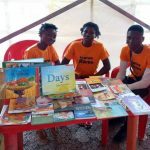 Amadi’s love for literature and his prolific output in his early years overshadowed his scientific background especially after the Civil War when he settled down to work as an educationist and public administrator in Rivers State. It was in this period that he embarked on the experiments in new forms of writing of which this work is a slight but unforgettable example.